Friday has become our eating out day this winter. It seems like we’re not as motivated to leave once J gets home from work. There’s just something cozy about curling up on the couch under a blanket that prevents us from venturing out farther than the mailbox. J was a little later than usual this afternoon, so it gave me time to find a place to eat. The cold, dreary weather has also affected my brain. Whenever I make a mental note of a place I want to eat at, I forget about it when it’s actually time to eat. 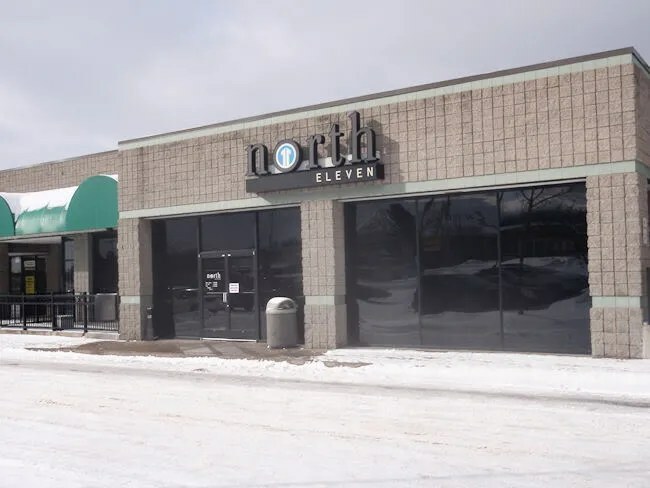 I was searching Urbanspoon trying to come up with a new place and North Eleven popped up. From where we live, it’s on the other side of town on Gull Road just east of Sprinkle Road in a shopping center which actually makes it a little hard to find. The storefront is pretty plain and mostly glass windows. Even for a strip mall, it’s pretty plain. It took J a second to actually pick it out and realize where we were going. Once inside, you step into an atmosphere that is anything but plain. The restaurant has an upscale lounge feel to it with brick walls, a fireplace, pendant lights, and sleek furniture that give it a modern feel. The hostess station is right inside the door and the dining room is right behind that. There’s a bar to the right which boasts an extensive martini list. We were seated in a booth in the fairly busy for 2:00 dining room. It turns out my mom called right as we were being seated so I stepped outside to take the call while J sat down and ordered us drinks. By the time I got back, a waitress was coming with our Pepsi’s and I had just enough time to look over the menu. I ordered the Black and Bleu burger. I went with the ground beef patty which is cooked with Cajun spices then topped with a mound of bleu cheese crumbles. The burger was perfectly cooked and served on a toasted bun. 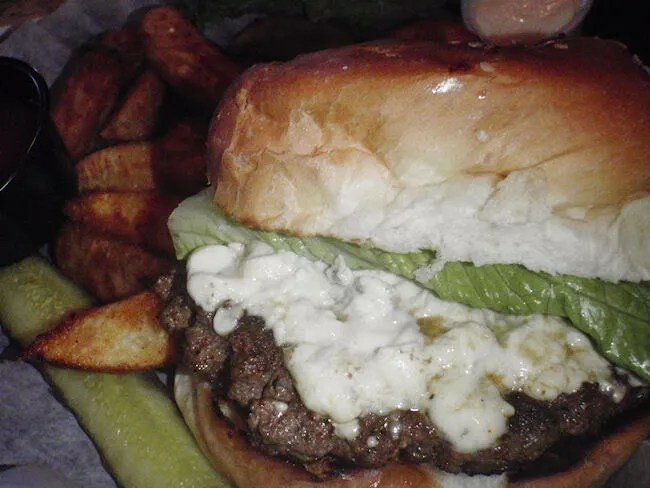 There was large pile of bleu cheese on my burger which made me really happy. I got a lot of bleu cheese in every bite. The sandwich came with fries which are more like potato wedges than the traditional french fries, but they are cooked all the way through and seasoned really well. The portion size was just right and I walked away pretty full. J picked a sandwich off the menu that didn’t do anything for me at first, but once I saw it, I kind of got a little jealous. 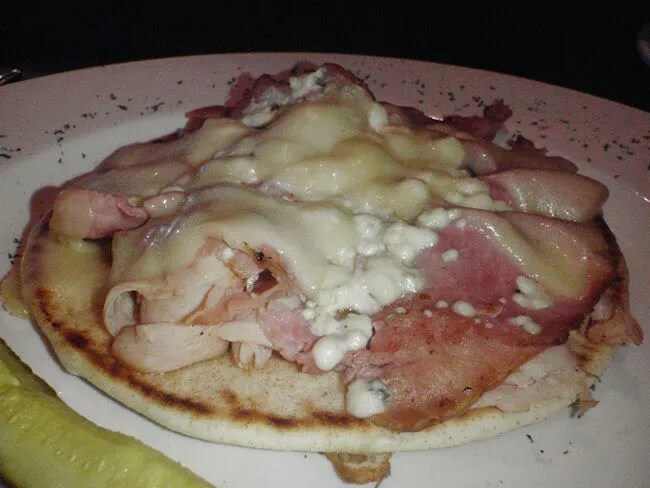 She ordered the Aristocrat which is an open faced sandwich with grilled ham, turkey, onions, tomatoes, Swiss and bleu cheese. She asked to leave the onions and tomatoes off. The sandwich was absolutely delicious. The flatbread was a good choice and held up well to the mound of meat on top of it. She said the ham was the dominant flavor which she was fine with. She prefers ham over turkey anyway. She was planning on only eating half and either giving me the rest or taking it home, but it was too good. I got two small bites and she finished off the rest. 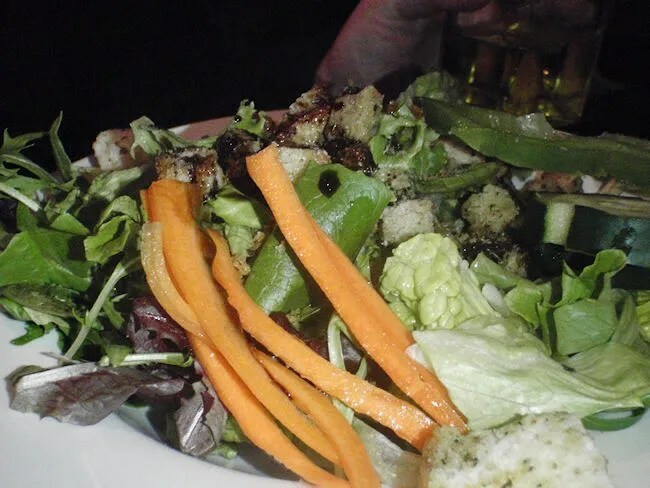 For her side, she chose to go with the House Salad. It’s a pretty basic salad with mixed greens, tomatoes, carrots, bell peppers, and cucumbers. She asked for an oil and vinegar dressing and they brought out little bottles of oil and vinegar so she could dress the greens herself. The weird thing was they brought the salad out with the sandwiches. She would have preferred the salad to come first which may also have prevented our only real problem with the meal. We both had empty glasses for quite a while by the time our waitress brought our meals out. She did grab the glasses to go get refills as we started eating, but it took a long time. I had eaten 3/4 of my sandwich before we even saw our waitress again and it still took a while for her to make her way back to our table. When she picked up our drinks, she picked up drinks for a couple that had just sat down and went to them first. As she was dropping off their drinks and trying to walk away, the woman at that table started asking questions about the menu delaying our drinks another five minutes as we sat there eating with nothing to wash down the food. It wasn’t horrible, but it was inconvenient and something that stands out about the experience. 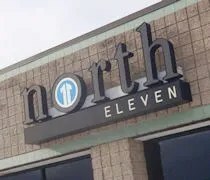 Our bill was around $23 and other than the lack of drinks through most of the meal, we really enjoyed North Eleven. The food was really good and we were both really satisfied with our meal selections. “The Aristocrats!” Ever see the movie? I don’t know if I could eat anything by that name because I’d be thinking about the joke, which is, um, an appetite suppressant.